This is page one of a set of six pages of original art that I acquired directly from Mr. Navarro when we were both employed as staff storyboard artists on the short-lived “Stripperella” animated TV series for Nickelodeon (Pop Tunes). I traded 6 pages of my own original artwork from issues of Catwoman and Batman for these pages which first saw print (I assume but am not sure) in Sonambulo v.1 #3, in a story called “Carnival of Souls”. 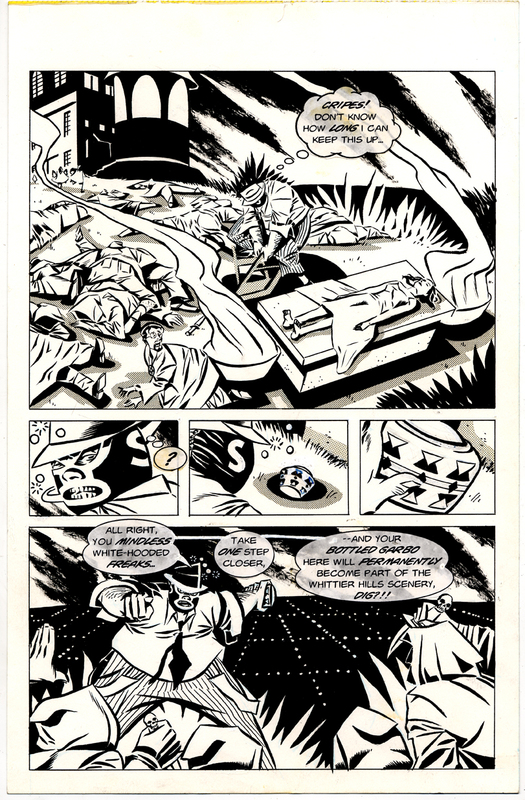 They were reprinted as chapter 4 of the graphic novel in “Sonambulo in Sleep of the Just: The Collected Cases”. The “Whittier Hills” referred to in panel 5 is, I assume, an actual location with which the artist was familiar. “Whittier is a city in Los Angeles County, California, about 12 miles southeast of Los Angeles. The city had a population of 85,331 at the 2010 census, up from 83,680 as of the 2000 census, and encompasses 12.7 square miles” (from Wikepedia, the free encyclopedia). This was the artist’s stomping-grounds, and his use of these sort of details (highly abstracted and simplified though they are) in his work lend credibility and verisimilitude to the otherwise fantastic storylines. I admire the use, in panel 5, of a few well-chosen white dots to depict the vast panorama of the city below.